After an 8 hour drive from Oxford to Aviemore, I met AJ in the pub. A big of food, including my first taste of haggis (lovely) and a few ales and then we went back to SYHA to sleep. We got up late ish on the next day and decided to head down to the area that Benji had been lost in, near the Balsporran cottage. We kept an eye out for him all throughout the day, but sadly saw nothing. We parked in a layby close to opposite of the cottage and put all our gear on, whilst getting sprayed by every passing lorry. We went through the cottage and over the train track and then headed up on the path to the right of a gully. A short way up, there was a guy on a small digger rebuilding the path. 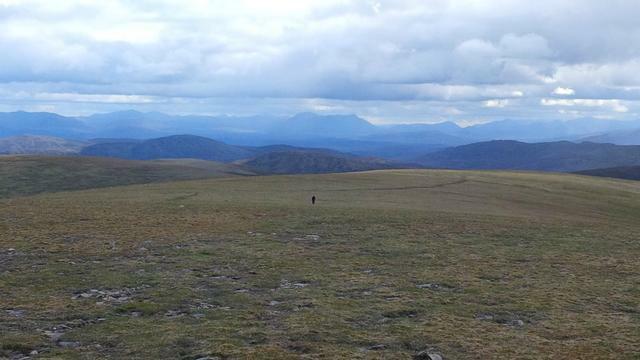 We got up onto the ridge and then headed left on towards Geal Charn. My first walk for a while and it was taking a while for my legs to get going. 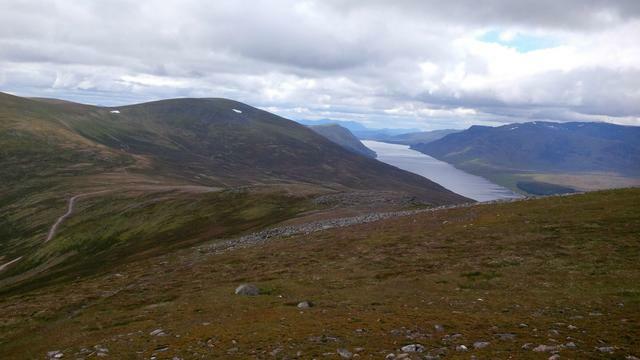 After some biting wind we made it up onto Geal Charn, which was my first Munro. A quick photo on the top of the cairn and then we headed of towards A'Marconaich. We dropped down to the col and decided to ignore the path and go straight up the flank of the hill. AJ rushed off ahead to leave me toilling up the steep slope. AJ is considerably more hill fit than I am and this dynamic continued throughout the day. Steep hills just kill my legs, as i'm from the flat Oxfordshire, so get no hill practice. We made the summit and then headed off over to Beinn Udlamain, which luckily had very little drop and re-ascent. After 50 minutes we were at the large summit chairn, covered in rusty stakes. A quick bite to eat and a few photos from a little shelter and then we headed off. Onto the last Munro of the day. We dropped right down to the col and tried to keep to more gentle inclines. It got a little steeper near the top and AJ raced away. I didn't see him for about 25 minutes and when I did he was about 900 metres away. I finally caught him up at the summit trig point of Sgairneach Mhor. 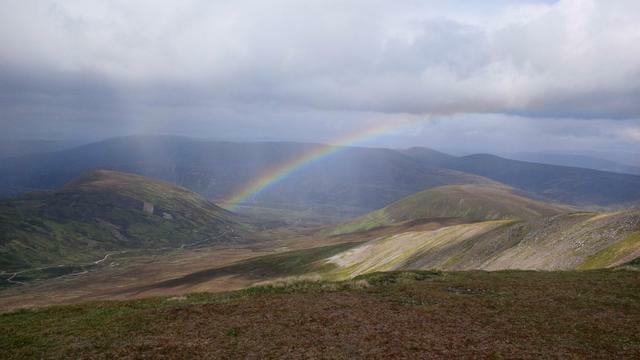 We had a nice view back down to the A9 and a huge rainbow. We headed downwards, towards the road and decided to go up the Sow of Atholl as well. To be honest my legs were absolutely knackered and in hindsight I probably shouldn't have bothered. I made it up there quite a time later than AJ. On the way up I had a little confrontation with a Grouse. Its babies flew off and he led me a merry dance up the hill, away from them. That raised my spirits a little. After hitting the top, we dropped back down the way we came to the valley and follwed it back to the A9, after a dodgy jump over some fences to cross the train tracks. The last 2.5 miles to the car, were not fun. My feet were aching like crazy! I did a lot of swearing and spent a lot of time looking at all the rubbish on the side of the road. We got back to the car in the end at 8:45pm. 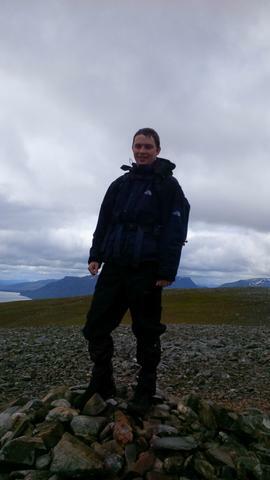 A good long walk, including my first Munro's and Corbetts. Last edited by Ibex on Thu Jul 04, 2013 1:07 am, edited 1 time in total. A big walk for your first day Ibex! Aye, it was a good one. For some reason my left knee started really hurting when we got back to the hostel and and I led in bed. Right behind the knee inside. Very odd. Didn't hurt at all during the walk. Spent the day resting it and taking iuprofen. Loosened off a bit, over the day. Could be the beer talking though. Hopefully will be ok for the walk tomorrow. Missed this one, well done on a first munro Quite a distance for a first Scottish bagging walk, not surprised you were struggling. Ibex wrote: Aye, it was a good one. I had pain in my knee which sounds very similar. Right in the back, behind the knee, almost as if it is the muscles linking the knee at the back rather than the cap or anything. Wonder what it is? Mine started very suddenly last year on craggy slopes. It got better with swimming, but I felt it last walk, on these same hills in your report. More knee excercises needed I think! Susie - I saw a number of rainbows up there in the week. At least one a day. Some absolutely huge ones as well. Jonnykay - Aye, its a fair old drive, but well worth it for a weeks walking up there. At leaat i've broken my duck on the Munro's now. tredog - The knee thing is weird. Exactly as you describe it. I think it may be a tendon that runs down the back of the calf or something, with an insertion point behind the knee. Some kind of inflamation too, as taking ibuprofen seemed to help it. Live and learn eh! Good to see you up in the Highlands, Ibex. You beat me to your first Corbett; I got mine 3 days later. It's a big drive up from Oxford. When you were past Perth, and already approaching the national park, you may have seen that sign saying it's still over 100 miles to Inverness. We English certainly have some fun when we get to do the far northern hills! So not content with doing one Munro you go and do four plus a Corbett - no wonder knee's complaining! But with a long drive like that you need to make the most of your time up north. Here's to many more!